I'm so happy to be able to share this Sugar Pea Designs Sweet Sneak with you today! This little guy is definitely one GREAT CATCH! I just adore this raccoon...he totally reminds me of my own little guys when they were wee ones catching their first fish! Would you like to WIN the (insert set name) stamp set?! Hop along and visit with the SugarPeas and guests, leaving some comment love along the way! One lucky person will be randomly selected to win the Great Catch stamp set! Our fabulous July release will be available in the SugarPea Designs Online Shoppe at 6:00 AM EST this Thursday! 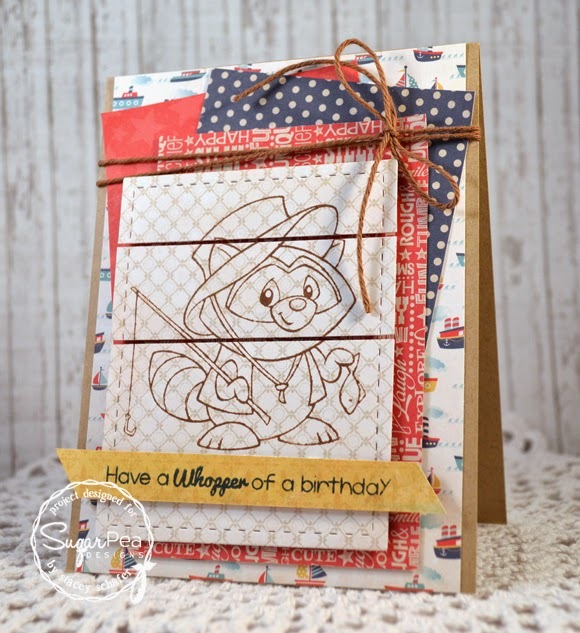 I stamped the raccoon with some dark brown in and stamped with onto a subtle pattern of patterned paper, then cut the image in horizontal strips to add some interest and depth to the focal panel. There are plenty of layers here, too...a bit of twine and a sweet sentiment banner to finish it off. what an awesome card, so different ! This is adorable! I love how you cut the main image, so creative! Great layers and choice of papers. I love that your image is not colored! It looks amazing! The pattern papers are so pretty! I am just floored on how amazing this looks with no coloring! You layouts are amazing!! Very cute! Love all the different papers and embellishments! The papers are so pretty and love your card design.. So cute!!! So many pretty layers. Love how you stamped the fisherman on the patterned paper. Makes a great design. wow! love him. the cut up panel is so striking. great card, Stacey. Great card - nice to have another way to use other than coloring him in! Love all the papers! I love the technique you used to stamp the image and then cut it in pieces. A great idea! The boat paper peeking out is cute. Such a great way to use the image, Stacey! Love it! This is one approach that I would never have thought of -- certainly makes for a great and easy card! How super unique is this!! Love how you used the image - looks like an adorable cartoon and perfect for a little boy card!! Love how you did this card Stacey! What a clever design, really love it!! So cute! Thanks for showing how fabulous the image can look even without coloring. It really gives a totally different look. Very cool Stacey. I love the cut up image and all your papers. This is darling! Love the design! You have such a unique stamping style with these images Stacey. I always love to see lots of layering and splitting the image in panels is so cool. Hugs!